The chambourcin hybrid grape is one of the varieties grown at this north Georgia winery. When the Boegner family found the property that would become Wolf Mountain Vineyards and Winery in the mid-1990s, it was 30 acres of pine trees located 60 miles from downtown Atlanta. Today, it’s a thriving vineyard. On a given Saturday, Wolf Mountain hosts 350 wine tasters and 200 people for lunch, followed by a wedding for 200 more at night. The vineyard actually had to start turning cars away one weekend because the facility had reached its fire capacity. But it took a while for the Boegners to reach this point. 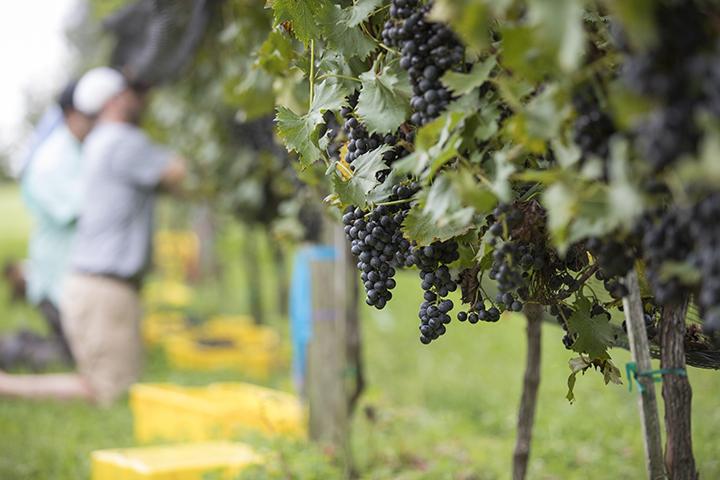 Buying the Dahlonega property, building the structures and investing both time and money in the vines and tools they needed to make quality wine was a risk, but the Boegners weren’t exactly new to the wine industry. Family patriarch Karl Boegner had served as an executive vice president at Chateau Elan in Braselton, and the family had invested in one of the area’s first vineyards, Blackstock Vineyards (now Kaya Vineyards and Winery). It took about four years to grade the soil, plant the vines, harvest a useable crop, and open Wolf Mountain to the public, but the time was well worth the wait. “We went from a 1,000 case production to 6,500 and continue to grow from there, with whites, reds and sparkling wine,” said Karl’s son, Brannon Boegner, the vineyard manager and chief winemaker. Those wines have gone on to win Wolf Mountain over 200 medals—including gold, double gold and best of medals—in The San Francisco Chronicle Wine Competition, the largest competition of North American wines and also one of the most prestigious, and the San Francisco International Wine Competition, among others. The SBDC partners with the Georgia Wine Producers, a statewide organization with the mission of growing the Georgia wine industry, to host conferences to convey this information. Dahlonega was also recently designated as Georgia’s first entirely in-state American Viticultural Area, a title bestowed by the Alcohol and Tobacco Tax and Trade Bureau that marks the area as a unique region to produce quality wines. Other more well-known AVAs include Sonoma and Napa Valley. They’re difficult and expensive to get, but the area’s new title, the Dahlonega Plateau, lends prestige to the wines created there. It also makes the area more of a tourist destination, said Matthew Garner, the tourism chair of the Dahlonega-Lumpkin County Chamber of Commerce. “The appetite for artisanal products in general is growing, and we’re certainly a part of that,” said Garner, who also manages Montaluce Winery. The influx of visitors also spawned what Montanaro calls “wine-adjacent” or “wine-related” businesses that cater to or benefit from the burgeoning wine destination. These include Bed and Breakfasts that host overnight guests visiting wineries, local restaurants where visitors eat on their trips, tourism companies that tote guests from one vineyard to the next and more. When people think “Georgia wine,” they tend to think muscadine, that sweet, fruity wine that’s best served cold and doesn’t age well. And it is true that Georgia does produce fine muscadine wines. But that’s not what Dahlonega winemakers are growing. The mountain town has experienced a surge in wineries in the past couple of decades, becoming a hot bed for grapes traditionally grown in Europe like Cabernet, Chardonnay and Merlot. The town’s climate isn’t exactly a mirror image of the Mediterranean, though. Fungal diseases, early- or late-season frosts, and heavy rains all introduce challenges to growing grapes. That’s where Cain Hickey comes in. The inaugural University of Georgia Cooperative Extension viticulturist, Hickey partners with vineyards across the state to run trials in their already established vineyards, testing new pruning, canopy management and trellising techniques, among other things, to see their effect on not just the yield but also the grapes’ composition and wine quality potential. “I joke about the fact that Cain landed here in March, and by the end of March we probably had our first grant. It was written and awarded by then because he just took off running,” DeFoor said. One of those studies showed that some advanced trellising and training methods could increase crop yield of the thick-skinned white wine grape Petit Manseng by as much as 70 percent. “When we crunch the numbers, that could result in $15 to $20 K more return revenue per acre when that crop is turned into wine and sold,” said Hickey. Oftentimes when yield increases, the quality of the grape decreases, but that wasn’t the case with the Petit Manseng trial. There was no remarkable difference in grape composition at harvest. The results of a similar trial on removing leaves around grape clusters to improve air flow, thereby decreasing the chance of rot or fungal diseases, left a winemaker so impressed that he invested in a mechanical leaf removal machine, which cost $30,000. Hickey’s work isn’t confined to just the fields. 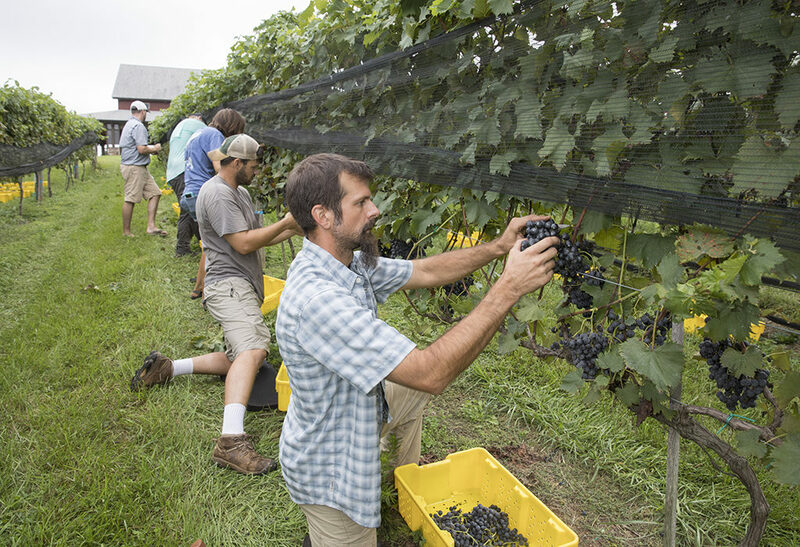 Through UGA Extension, he facilitates regional and statewide conferences, seminars and workshops for growers geared toward helping those who are just dipping their toes into the industry to those who’ve been growing and making wine for decades. His research plays an integral part in that. Cain Hickey, UGA Extension viticulture specialist, helps harvest grapes at CeNita Vineyard and Winery near Cleveland, Georgia. 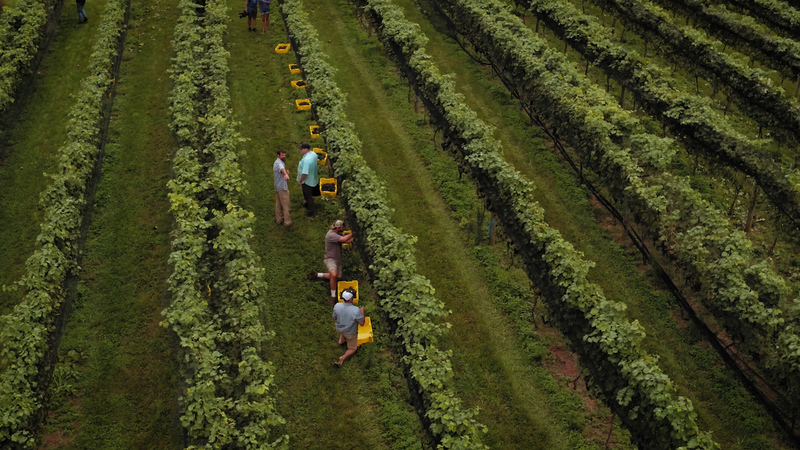 What is often described as a relatively young industry in the state has now grown to 60 wineries. And the appetite for locally produced wine doesn’t appear to be waning any time soon. Georgia’s wineries generated $88 million in annual tourism expenses in 2017, according to The National Association of American Wineries, and contributed a whopping $4.1 billion to the economy through its related industries.